Peter Frohmader - "Anubis Dance" / "Eismeer"
I've never had the opportunity to visit the Middle East but I imagine that if I were to walk into a discotheque (for the countries in that region that have them) the music might sound very much like what Peter Frohmader has created on Anubis Dance. A bit of Lawrence Of Arabia, a dash of The Beatles "Within You, Without You", a huge circle of whirling belly dancers, a foundation of ambient washes, robotic electro beats, and totally cosmic dance rhythms and efx that make this a mind-bending rave-in-space voyage. 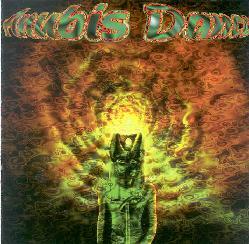 From start to finish Anubis Dance is a non-stop roller coaster ride that allows the listener few opportunities to come up for air. Frohmader sets the tone for the set from the opening track, "Entrance". A Middle Eastern call to prayer horn, strings, and chants weave their way through pounding electro dance rhythms and darker symphonic segments. The mood is both toe tapping and mucho trippy. Anubian Lights certainly comes to mind, though Frohmader's music has a far more intense cinematic feel. Throughout the album the dance rhythms often reach frenzied rave levels, but the trip factor is high as Frohmader creates an aural lightshow effect with swirling space electronics and efx'd chanting and other crazed vocals. It certainly helps that the music is beautifully recorded and mixed, making for quite a wild headphones party trip. "No Panic" and "No Panic V.2" are my favorites of the set. The former is a space dance piece that can get quite delirious at times. But like most of these songs, Frohmader takes several thematic twists and turns, including cosmic Reggae, old time Tangerine Dreamy keyboard patterns, and heavy prog rock, sometimes all glomed together. "No Panic V.2" is the most reminiscent of cosmic spaced Krautrock á la Tangerine Dream or Klaus Schulze, but with a more contemporary sound and feel. In short, this is a killer set of alien dance instrumentals that will delight Krautrockers looking for something fresh, and send the ecstasy rave crowd blasting into the stratosphere. Stylistically in a completely different universe is Eismeer, Frohmader's new release on the Musea label. The CD consists of three tracks, the two highlights being epic 37 and 24 minutes works. The first minutes of the title track bring to mind bands like Present, Univers Zero and Art Zoyd. The music has a very dark avant chamber music feel, and it almost sounds like Alain Rochette on the piano. The subtitle Symphonic Poem is a fitting description for this massive 37 minute work which leads us through a parade of themes, all evolving seamlessly from one to the next. In the CD liner notes Frohmader describes Eismeer as "a musical expedition, a ship's movements on the sea, set to notes". "Expedition" is the key word for this listener as that is precisely the sort of voyage I felt I was on as the aural narrative created stunning and ever changing scenery. Both high intensity and drifting meditation are the extremes that can be expected here... as well as musical characterization, brightly textured soundscapes, and the distinct feel that a story is unfolding. "Funebre" is a brief mellow piece that serves as a transition to the next lengthy work, "Orchestral Crossover". Crossover indeed... The track consists of an interesting mixture of free-improv jazz, electro dance beats, orchestral and symphonic explorations, and other avant-garde bits. Early on we hear jazz trombone and rolling bass combined with techno beats, which soon segues into a more orchestral segment that still retains the jazz influences and multiple other elements. There's LOTS happening here! And similar to the title track, this 24 minute journey includes multiple movements that Frohmader has masterfully composed and executed. In fact, the liner notes point out that unlike much of his work which relies on improvisation, Eismeer was "composed stringently". In summary, following Peter Frohmader's music is always exciting and rewarding because of the diversity of his work and high degree of excellence that results in these varied endeavors. Anubis Dance and Eismeer couldn't be more different from one another, but what they do have in common is a creative blend of multiple styles and influences. Each could be recommended to fans of different genres, though I'd say followers of Frohmader's work will most definitely appreciate both. For more information you can visit the Peter Frohmader web site at: http://www.peterfrohmader.de. 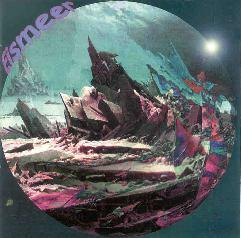 Eismeer is distributed by Musea Records. You can visit their web site at: http://www.musearecords.com.